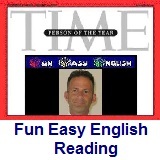 ﻿ Fun Easy English - reading practice and learning about the holiday Diwali. Diwali (English pronunciation: /dɪwɑːli/) also called Divali, Deepavali or the "festival of lights", is a five-day Hindu festival which starts on Dhanteras, celebrated on the thirteenth lunar day of Krishna Paksha (waning moon fortnight) of the Hindu calendar month Ashvin and ends on Bhau-beej, celebrated on the second lunar day of Shukla Paksha (waxing moon fortnight) of the month Kartik. Dhanteras usually falls eighteen days after Dussehra. In the Gregorian calendar, Diwali falls between mid-October and mid-November. The name "Diwali" or "Divali" is a contraction of deepavali which translates into "row of lamps". Diwali involves the lighting of small clay lamps filled with oil to signify the triumph of good over evil. These lamps are kept on during the night and one's house is cleaned, both done in order to make the goddess Lakshmi feel welcome. Firecrackers are burst because it is believed that it drives away evil spirits. During Diwali, all the celebrants wear new clothes and share sweets and snacks with family members and friends. I would really like to visit one of the countries where Diwali is an official holiday. It seems like a very nice holiday spent with family and friends. 1. Diwali is also called which of the following? 2. Diwali is which of the following? 3. Diwali is an official holiday in all but which of the following? 4. For Hindus, Diwali is one of the most important festivals of the year and is celebrated in families by performing which of the following? 5. Diwali involves which of the following?